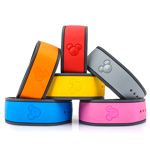 Tagged with "Magic Band Facts"
Magic Band Facts No. 1 - Magic Bands are not symmetrical! Here is the first in our series to feature facts about Magic Bands. Magic Band Fact No. 1 - Magic Bands are NOT symmetrical!